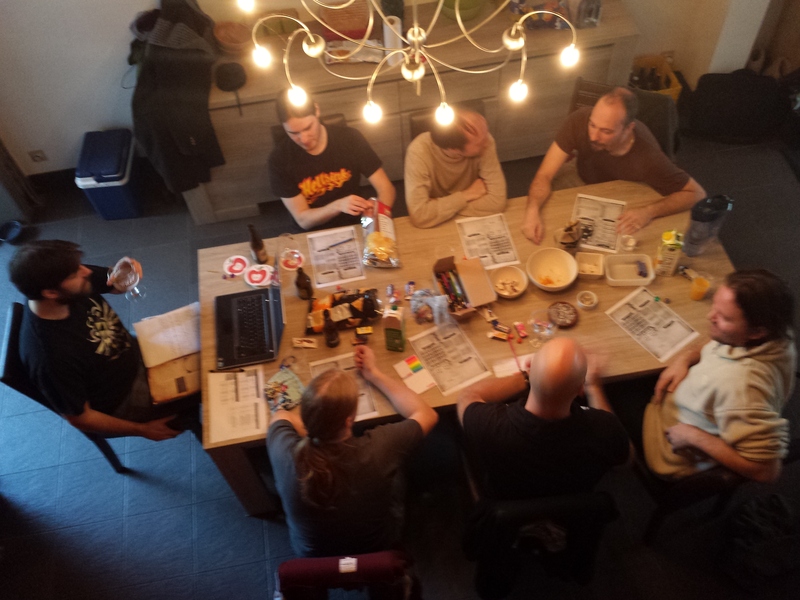 Our little housecon got a second edition yesterday. About 18 people showed up to play in Kessel Run II. We ran three tables and played six games, and that’s not counting the secret pre-con game. Due to a fuckup in registration on my part, we actually had two attendees too many, so a few games were a bit more cramped than they should have been. Stan ran a 5-man Monster of the Week. Five is a bit much for MotW but it seemed his players had a great time running rough shot over the scenery. I have no idea what actually happened, but it sounded like chaotic fun. Sven ran a Call of Cthulhu amnesia-game where all the female players were serial killers in a mental institution. The one male player was their psychiatrist. They gave him a very hard time before opening a portal to Yog Soggoth. Richard ran a game of Dogs in the Vineyard that got a lot of excited aftertalk. Apparently the party dynamics were sizzling, a lot of fun conflicts and interactions. 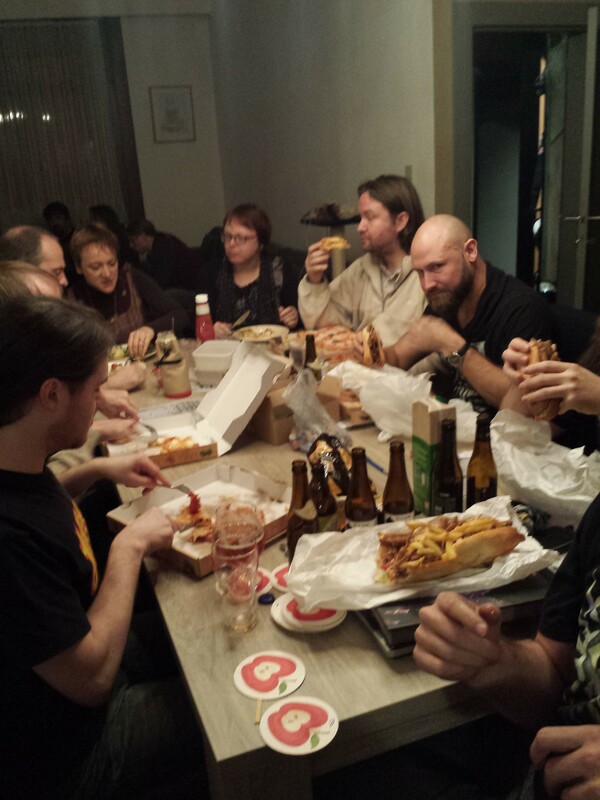 Jan ran a Dark Heresy 40k game with a full table of six people. That turned out to be a bit too much, but it was a lively game that I’m looking forward to getting to play as well! We mostly stuck to the tried and tested formula of the first Kessel Run. The main differences were that I refrained from running any games myself. Last time I ran two games while organizing the thing, and that definitely ruined me for a few days. A big shame, because we had guests over and I was useless company. This time we had enough GM’s for me to step back and I had a much more relaxed time of it: I could sleep afterwards and everything! We also tried to revamp the signup system a bit. The first time, we just had people sign up for the game of their choice in a document, and that lead to people piling onto the games that already had people in them and ignoring others, having to ask people to change games, etc. This time we tried something else. We asked people to make a top 4 list of games they wanted to play, and then tried to place them in games. Wow, that was a lot of work! It was like a sudoku puzzle of your friends hopes and dreams. Jan helped out and I think he puzzled on it for over a week. It worked well and everyone was happy with their choices, but it was too labor intensive. It didn’t help that we were were making the time slotting dependent on people’s choices. Next time we will slot the games first, and then have people choose. Hopefully that’ll be a bit less work for us! Onward to Kessel Run III, in the end of March!